If the Gluten Free Canteen's Book of Nosh were a bakery, there would be a line out the door every Friday for the braided challah. The team behind the Gluten Free Canteen blog, Stander and Horel bring you an entertaining and unusual gluten-free Jewish baking cookbook with delicious and easy recipes illustrated with mouth-watering photos. This is more than just a book of Jewish recipes -- it's a testament to keeping Jewish baking alive and well even while living gluten-free. They decode gluten-free flour, offer valuable gluten-free baking tips, and provide links to resources. The more than 30 tasty and texture-perfect tested recipes ensure no more double-duty baking of both regular and gluten-free desserts in your holiday kitchen. Even Bubbe would be impressed -- that alone makes holiday baking a mitzvah! "Gluten Free Canteen's Book of Nosh contains an amazing array of gluten-free Noshes that anyone following a GF diet CAN finally enjoy! Cookbook author Lisa Stander-Horel and photographer Tim Horel have proven that GF baked goods can look and taste just as good as their gluten-filled counterparts. Lisa's recipes were inspired by her commitment to keeping Jewish tradition alive. She learned how to bake from her late mother, who taught her that everything should be made with love. Recipes include Cherry Chocolate Mandelbroit, Coconut Matzo Rocky Road, Kichlach, Rugelach, Chocolate Rum Babka, Apple Upside-Down Cake, Honey Cake and Mom's Marble Chiffon Cake. There are 5 different challahs including Quick Challah, Braided Challah and Turban Challah with Raisins - even Potato Matzo, kugels and latkes! Lisa Stander-Horel includes her secrets to successful GF baking, from helpful tips and resources to information about essential ingredients. Recipe methods are clearly written and easy to follow, even for the novice GF baker. This is a must-have cookbook for the gluten-free baker who craves traditional Jewish baking for holidays and every day. Enjoy every bite!" 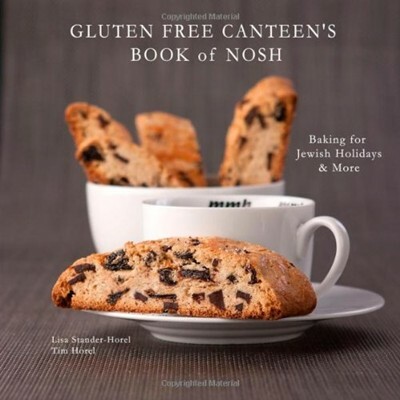 "Gluten Free Canteen's Book of Nosh is a delightful -- and much-needed -- addition to the world of Jewish baking. Beyond the delicious gluten-free offerings, Lisa Horel invites us to lovingly recall the daily lives and passions of our "noshing" ancestors. In doing so, Horel has provided gluten-free homes with an opportunity to reclaim -- and re-envision -- the culinary wonders which have enhanced Jewish life for generations." "Mazel tov to Lisa and Tim, the Gluten Free Canteen team, for compiling a lovely collection of gluten free Jewish-inspired recipes. The baked goods look particularly tempting! What a wonderful resource for home cooks struggling with gluten intolerance."